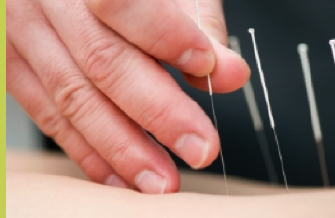 Medical Acupuncture – one of the treatments available at Cheadle Osteopathy. At the Cheadle Osteopathy clinic, several of our Osteopaths are trained to use a form of acupuncture called Western Medical Acupuncture. They can use on its own or as part of your conventional Osteopathic treatment. This can be an excellent way of help with pain relief and reducing muscle spasm. Western Medical Acupuncture (WMA) is a therapeutic technique involving the insertion of fine needles into specific points of the body. It is an adaptation of Chinese acupuncture using current knowledge of anatomy, physiology and pathology, and the principles of evidence based medicine. WMA acts principally by stimulating the nervous by way of the skin and muscle, and can produce a variety of effects. It is mainly used to treat musculoskeletal pain, including myofascial trigger point pain. It is also effective for postoperative pain and nausea. Acupuncture has been proven to increase the body’s release of natural painkillers – endorphin and serotonin – in the pain pathways of both the spinal cord and the brain. This modifies the way pain signals are received helping to reduce the pain. Acupuncture does much more than reduce pain, and has a beneficial effect on health. Acupuncture can relieve symptoms of some physical and psychological conditions and may encourage the patient’s body to heal and repair itself, if it is able to do so. Patients often notice an improved sense of wellbeing after treatment. as well as the respiratory, digestive, urinary, and reproductive systems. Treating patients from all over Greater Manchester, including Stockport and Cheadle, our practitioners will assess each patient’s case individually and treatment will be tailored accordingly. Typically, the needles are inserted through the skin and left in position briefly, sometimes with manual or electrical stimulation. The number of needles varies but may be only two or three. Treatment may initially be once a week, then at longer intervals as the condition responds. Typical courses of treatment can be 3 to 6 sessions. To find out more about the Osteopaths who use Acupuncture please click on practitioner profiles for more information.